Omar Ostoich was born in 1925. He likely attended Mark Keppel High School in Los Angeles, California. He was drafted into the military, and reported for duty on April 22, 1943. His enlistment record states that he was single without dependents. Casualty Roster Rolls from the U.S. Army indicate that he was Catholic. He does not appear in the census records, so little is known of his family. Omar’s last name, “Ostoich” is of eastern European heritage. He may have been a relatively recent immigrant from the former Yugoslavia, Czechoslovakia, or Russia. Ostoich grew up in Alhambra, California, which is just outside of Los Angeles. Alhambra was founded in 1771 and drew a lot of attention in the mid-nineteenth century when the California Gold Rush began. When World War II began many residents participated in the war, both on the homefront and as soldiers. Under President Roosevelt’s orders, every city in the country had to arrange their own civil defense system. Alhambra's Civilian Defense Chapter offered classes, often conducted by World War I veterans, on dealing with emergency situations. Once he completed basic training, Private Omar Ostoich became a member of the 508th Parachute Infantry Regiment of the 82nd Airborne Division. The 508th Parachute Infantry Regiment was activated in October 1942 by Major Roy E. Lindquist and was comprised of recruits primarily from the 502nd Parachute Infantry Regiment and the 26th Infantry Division. By December 1942, the 508th Parachute Infantry Regiment reached full strength. The following month the regiment moved to Camp Mackall in North Carolina. On December 28, 1943 the team boarded the U.S. Army transport ship, the James Parker and traveled for 12 days landing on January 9, 1944 in Belfast, North Ireland. From there, the 508th Parachute Infantry Regiment became acclimated to their new environment and trained heavily until D-Day on June 6, 1944. Operation Neptune was an all-important airborne phase of Operation Overlord, the name given to the massive aerial, naval, and ground invasion on D-Day. The 82nd Airborne Division, particularly the 508th Parachute Infantry Regiment, was an integral part to Operation Neptune. Along with the 507th Parachute Infantry Regiments, they dropped into Normandy to destroy vital German supply bridges and capture causeways leading inland. More than 10,000 soldiers landed by parachute or glider in the early morning hours of June 6, 1944. This has become known as the greatest airborne assault in human history. The 508th Parachute Infantry Regiment’s mission was to capture and control bridges over the Douve River, located near Beuzeville-la-Bastille. The confusion and scattered landings were compounded by the German presence in the scheduled drop zones. This prevented the pathfinders from marking the drop zones correctly and consequently delayed many pilots from switching on the jump lights until they had overshot the drop zones. Many paratroopers landed far from their intended drop zones. Landing in the swamp lands along the river, the heavily laden troopers scrambled to assemble into fighting units. The paratroopers regrouped and seized the bridge over the Douve River, at Pont L'Abbé. After this initial mission Ostoich survived another ten days, making his way through hedgerows and securing essential causeways to help the Allied advance. On June 15, 1944, Private Omar Ostoich was on night patrol when his commanding officer sent him back to their point of departure with a message. He never returned, and his remains were never found. He is memorialized on the Tablets of the Missing at Normandy American Cemetery. My name is Javier Romo, I attend Serrano High School where I am learning about a loved soldier by the name of Omar Ostoich. Omar was a boy when he joined the U.S. Army. He earned a high school diploma and then was sent straight to the military. It is sad to think he was the same age as I am now. Thinking of war, its struggles, horror, and outcomes, is simply terrifying. We can only imagine what he was thinking when the war started, knowing that he was of age to join. He has taught me, and everyone else who will know his story, of sacrifice. It is sad that after six months of researching him there is no trace of Omar’s parents or any possible brother or sister. Since most of the information on Omar was lost to history, there is no information regarding his achievements. When he was drafted, Ostoich was single with no dependents because he was just starting his adult life. Ostoich went missing on June 16, 1944 while on a mission, and was declared dead one year and one day later. I learned how being a part of war can make you lose connections to everything like family and friends. Researching Ostoich was challenging. By spending more time researching Ostoich, I feel as though I came closer to feeling how he may had. He came from the local city of Los Angeles. His home town is very close to ours, but his actions were much more. Our schools are close, considering Los Angeles is around an hour and a half from mine. After I completed this Silent Hero project it made me also realize no matter how hard work is I can find a way to get the answers somehow. I am able to realize what it is really like to honor someone who had died for everyone else’s cause. Omar’s story will not end anytime soon. Before researching this Silent Hero, I hardly knew what it was to honor the fallen who had really fought for a reason. I feel like his commitment has a positive impact on my life and all of my friends and family’s lives. It is strange to feel how one single person can affect so many people’s lives. 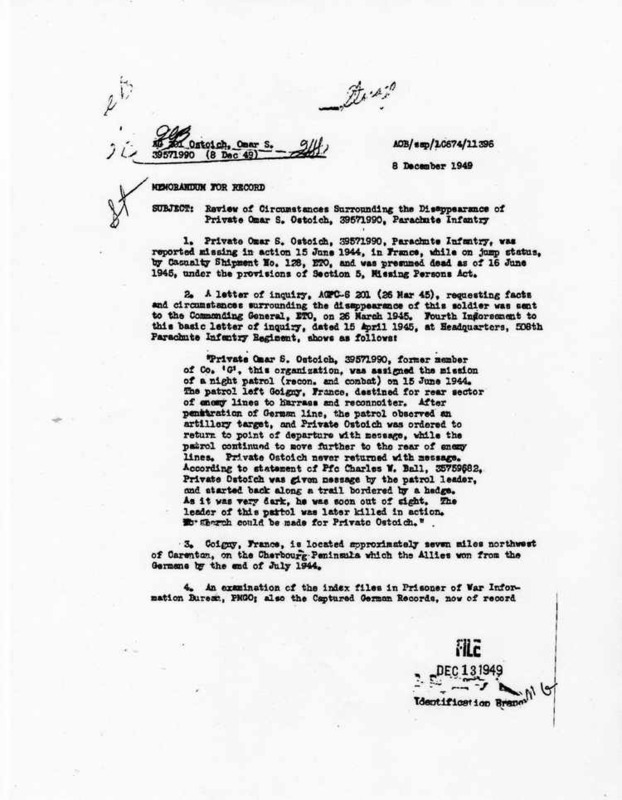 Memorandum for Record in response to the status Omar Ostoich, December 8, 1949. U.S. Army. National Archives and Records Administration. http://www.508pir.org/taps/images/ostoich_os__01.jpg. Omar Ostoich, Register, World War II Dead Interred in American Military Cemeteries on Foreign Soil and World War II and Korea Missing or Lost or Buried at Sea. National Archives and Records Administration. Digital Images. http://ancestry.com. Omar Ostoich, Rosters of World War II Dead (all services). U.S. Army. Digital Images. http://ancestry.com. Records for Omar Ostoich; World War II Army Enlistment Records, 1938-1946 [Electronic File], Record Group 64; National Archives at College Park, College Park, MD [retrieved from the Access to Archival 2011 at http://aad.archives.gov/aad/series-description.jsp?s=3360&cat=WR26&bc=,sl, October 12, 2017]. "A Brief History of the City of Alhambra." City of Alhambra. Accessed October 12, 2017. http://www.cityofalhambra.org/page/249/history_of_alhambra/. "The 508th Parachute Infantry Regiment Unit History." The 82nd Airborne in World War II. Accessed October 12, 2017. http://www.ww2-airborne.us/units/508/508.html. "PVT Omar S. Ostich." 508th Parachute Infantry Division. Accessed October 12, 2017. http://www.508pir.org/taps/graves/o/mia_ostoich_os.htm. “Omar S. Ostoich." American Battle Monuments Commission. Accessed October 12, 2017. https://abmc.gov/node/412220#.Wd-wn1tSzIU.